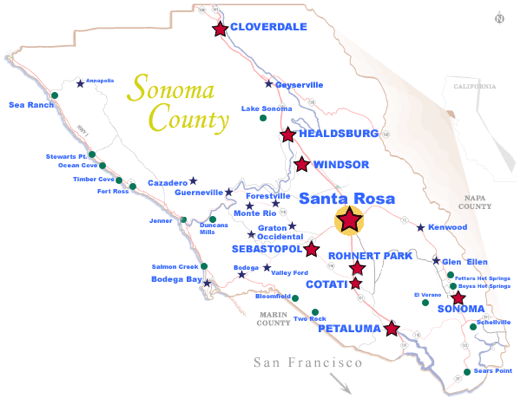 Sonoma County is the largest of the counties surrounding San Francisco Bay and its northern extension, San Pablo Bay. 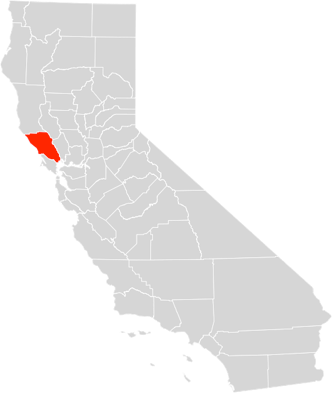 Its size, coastal location (including parts of the West Coast migration route), and mountain ranges within its borders combine to create a wide variety of habitat for birds including: Pacific Ocean coast; coastal mudflats; brackish estuaries; riparian zones along the Russian, Petaluma, and Gualala Rivers; alluvial valleys; urban and suburban settings; foothills of the Mayacamas range; and heavily wooded mountainous terrain, especially in the northern and eastern parts of the county. The highest peak in the county is the North Peak of Mt. St. Helena, which rises to 4,344 feet. The Laguna de Santa Rosa forms a complex estuary system, one of the largest freshwater wetlands complexes in northern California (The Laguna de Santa Rosa Foundation has an excellent Website with details). Sonoma County has 53 miles of coastline, pierced more or less in the middle by the Russian River, near Jenner. The southern extreme of the county has 12 miles of coastline along San Pablo Bay. The Sonoma County bird species count (one accepted sighting or more) currently stands at about 438, roughly 45% of the 969 species the American Birding Association recognizes as having occurred at least once in the entirety of North America north of the Mexican border (as of 2011)--a remarkable fact given that Sonoma County in terms of land area accounts for only about six thousands of a percent of the area of the contiguous 48 states. Dedicated birders normally find more than 300 species in the county each year (about a third of the North American total). At the richest locations (such as the Bodega Bay area or Spring Lake) knowledgeable bird watchers can see 70 species or more on a good day. About 50 species in a day is quite common. For detailed species lists, see the links below. © Colin Talcroft, 2009, 2010, 2011, 2012. All rights reserved.